The SCUBA National Touring Network for Dance provides the crucial cross-pollination needed to maintain, develop, and diversify a dance community. Bringing together communities in Seattle, San Francisco, Minneapolis, and Philadelphia, SCUBA gives artists the opportunity to share work across the country. This year’s Seattle performances featured the work of Shannon Stewart—Seattle’s own—and Philadelphia’s Green Chair Dance Group, as well as a commissioned work from Velocity Creative Resident Maureen Whiting. 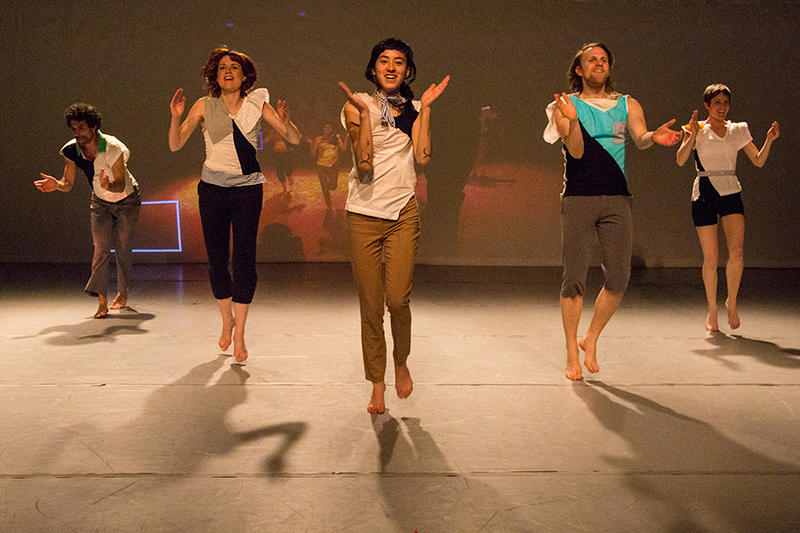 The three sold-out performances in Velocity’s Founders Theater April 26-28, 2013, provide a solid indication that Seattle wants to see dance, and that Seattle wants to see dance from other places. Stewart presented an excerpt from her work, An Inner Place That Has No Place, which takes on the multifaceted experience of memory, in all its blurry confusion. The choreography conveyed this aspect of memory well, but additional elements enhanced how the audience perceived the piece and went through the experience of memory. The simple but powerful video projection from Adam Sekuler and the carefully considered lighting design from Jessica Trundy (executed at Velocity by Meg Fox) made Inner Place a complete and compelling work of art. Five dancers entered the stage one by one as the audience mingled in a fully lighted theater. Slowly, the noise level grew to cacophony as the sound score (by Jeff Huston) took over the senses. Lines between audience and stage were effectively blurred as the space transformed from present time and place, with all the accompanying sounds, to something else—to memory, to the performance on stage. All went dark, and when the stage lights came up, the audience was fully immersed in the world on stage. Five strong performers displayed a broad spectrum of dancing, from repetitive, non-stop action incorporating an ongoing dialogue of questions about memories (“Where were you born?” etc. ), to soft, passive partnering and manipulation, to goofy expressions in a progression of “snapshot” poses. The piece’s blend of wry humor and desperation was most apparent as the group tried to cling to and refresh their last cheesy photo pose: a poignant reminder that once a moment has passed, trying to recreate and relive it can be frustratingly fruitless. Maureen Whiting’s About a Tree led the evening in a much darker direction with a work that entered the cruel natural world. An ensemble of women and men, which included Whiting, surrounded a large, two-piece tree structure lying horizontal on the ground with a collection of detached leaves and branches. Dancers interacted with these structures and each other in fluid roles that seemed to shift between animal, human, and plant. They devoured each other like packs of wild animals, breathed in rhythmic patterns as they rose to life, and took pieces of wood and leaves upon their bodies as they became tree-like themselves. The costumes served to dissociate the dancers from any single identity. White shirts and bottoms were abstracted from their humanness by a piece of dark brown cloth on a different part of each dancer’s costume; dramatic, reddish make-up was reminiscent but not too rigidly symbolic of blood. Repetition of sharp or rhythmic gestures, full-body movements, and breath played against sinuous movement phrases filled with images of frailty. A sense of urgency carried throughout About a Tree, as if life were no certain venture— a glaring truth of the natural world. Though this dark intensity seemed a little heavy-handed at times, Whiting and her dancers were totally committed to the dance and to one another making for a captivating performance with memorable visuals centered in the natural world. Philadelphia’s Green Chair Dance Group rounded out the evening with the hilarious Tandem Biking and Other Dangerous Pastimes for Two. Choreographed and performed by Green Chair Project members Sarah Gladwin Camp, Hannah de Keijzer, and Gregory Holt, Dangerous Pastimes was a series of talking and dancing vignettes held together by a clear movement vocabulary that shifted in quality for each section. Camp, de Keijzer, and Holt are three capable movers who transitioned softly and generously in and out of the floor and between partnerships with one another. They also looked and acted like everyday people in possession of their own personalities, even as their movement and situations verged on absurd. In one of the most poignant and clearly narrative moments, de Keijzer and Holt fall into an embrace and subsequent duet without Camp—this is Dangerous Pastimes for Two, after all. Camp later shuffled back on stage dressed head to toe in snow gear and revisited some of the group’s movement phrases. Having been “frozen” out of the friendship, Camp became stunted and unfulfilled in the presence of so much bulky clothing. The piece highlighted the tricky relationship between words and movement, exploiting this for comedic effect. Early on, Holt attempted to describe and show a duet between the other two dancers, failing utterly in a ridiculous display of how inadequate language and one body is for communicating a whole dance. On the other hand, they introduced sections with a recurring kind of title: “We are Luscious People” later became “We are Desperate People.” This use of language let the audience understand the ensuing dance in a way that they might not have with movement alone. SCUBA 2013 provides a reminder of how important it is to see and share dance from other communities. Each work stood strongly on its own and as an ambassador for its home community. Stewart’s work, especially, captured a tone that manages to feel very “Seattle” while not being too enmeshed in Seattle’s particular dance culture. Her work for SCUBA is work that enriches any city’s arts community. Likewise, the Green Chair Dance Group brought a lightheartedness and whimsy that is only beginning to be seen again here in Seattle. Hopefully their presence will inspire more of it. The word from Velocity Executive/Artistic Director Tonya Lockyer is that SCUBA will receive support from the National Endowment for the Arts in 2014. Let the cross-pollination continue!